Any quantity only $2.99 per coin over spot! The United States Mint issued its first commemorative coinage in 1892 as a celebration of Christopher Columbus’ journey across the Atlantic Ocean. However, the most popular commemorative silver coins for sale from the United States Mint are those struck in the modern era from 1982 onward. Today, $1 Silver US Mint Commemorative Coins are available to you online at Silver.com. Ships to you sealed inside of a protective capsule! Struck primarily between 1983 and 1991, but continue today! Consists of .7734 Troy ounces of fine silver. 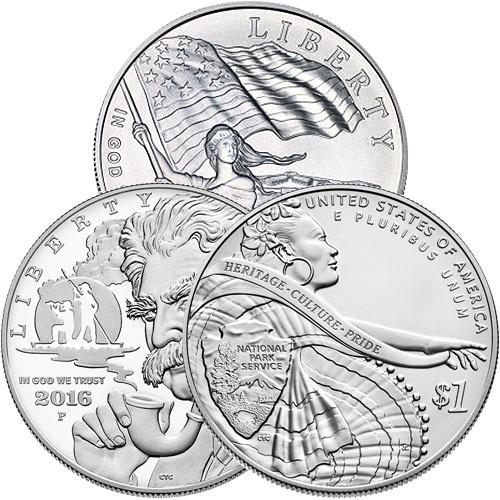 Obverse and reverse designs represent various moments in American history captured on silver coins in the US Mint commemorative catalog. In 1982, the United States Mint issued its first modern silver commemorative coin in the form of a half-dollar coin meant to celebrate the 250th birthday of the nation’s first president, George Washington. One year later the US Mint would issue its first $1 Silver US Mint Commemorative Coin with a celebratory coin for the upcoming 1984 Summer Olympics. All of the $1 Silver US Mint Commemorative Coins in this product listing are available to you inside of their original protective capsules from the United States Mint. From 1983 to 1991, the US Mint was extremely active in the production of $1 commemorative silver, but has since taken on a more random production schedule. Some of the most common designs from this era include commemorative Olympic silver coins and those celebrating important people, monuments, and moments in American history. For example, in 1989 a $1 Silver US Mint Commemorative Coin was issued honoring the 200th anniversary of the first United States Congress. The coins included the Statue of Freedom on the obverse and the Mace of the House of Representatives on the reverse. The 1990 $1 Silver US Mint Commemorative Coin featured images of Dwight D. Eisenhower to mark his 100th birthday. Two profiles of Eisenhower were featured on the coin’s obverse, with one capturing his figure as the four-star US Army general who served as Supreme Allied Commander in Europe during World War II and the other depicting him as the 34th President of the United States from 1953 to 1961. Silver.com will randomly select the $1 Silver US Mint Commemorative Coins you receive from this product listing. We cannot guarantee you a date mark or corresponding design. These coins come from various US Mint facilities, including all four modern mint locations. Please feel free to reach out to Silver.com with your questions. You can call us at 888-989-7223, chat with us live online, or simply send us an email with your inquiries. Again I got These 2 $1.00 commemorative Coins Today and They were Different I Love Them.I Like How Silver.com places them in the capsules Looks Great Plan on Buying More Soon. A good way to start stacking silver at really great prices and for Investment as well. I just order 20 of these and was disappointed in the variety of coins. Was hoping for a nice mix but instead got 16 Lewis and Clarks, 15 proof and 1 Bu, and 4 constitution proofs. 19 of the 20 were in perfect shape but one of the constitutions was yellowed and has some yellow and black spots on it. was disappointed that it was not perfect but then it grew on me. it made the constitution look old and worn which it is, so now its my favorite of all the coins. first order of 20 commemoratives came Most Excellently! Thank You Silver.com…i have ordered more today.